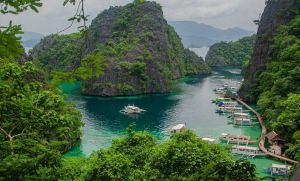 When it comes to beach bumming and sun worshiping, the Philippines is definitely one of the best destinations to travel to. Blessed with pristine white beaches and cerulean waters, the country is a tropical paradise that will not disappoint. If you love the beach and at the same time prefer the road less traveled, then here are remote sandbars in the Philippines you must visit at least once. They may be a bit hard to get to, but they are so worth the trip. A visit to this strip of white sand needs to be timed properly because as its name suggests, it completely disappears as it sinks into the sea during high tide. During low tide however, it truly is a piece of paradise. Great views all around plus you can snorkel in the area. Just want to get a tan? 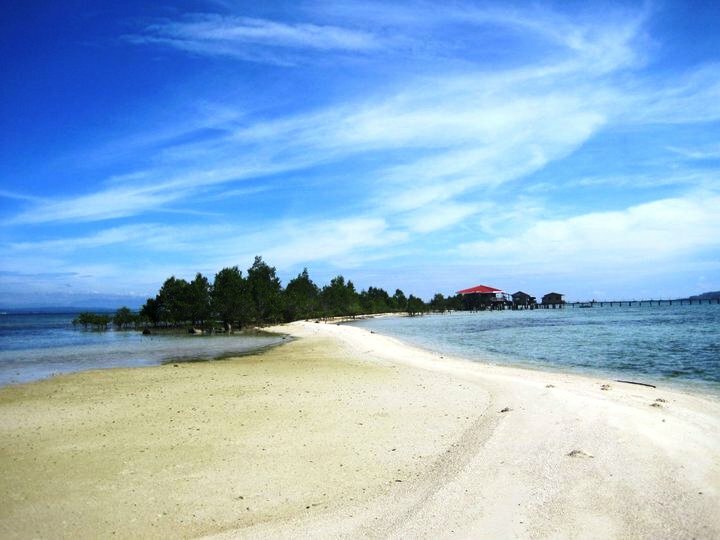 Then laze around on its powdery beach and feel all your stress melt away. 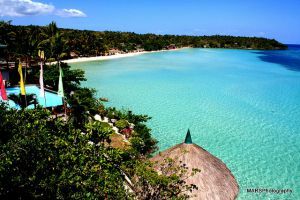 To get to the Vanishing Island, get to Davao City first via flights from Manila or Cebu. Then take a ferry from km 11, Sasa Port, Davao City to Barangay Tambo, Samal. From there, hire a small outrigger boat to get you to the sandbar. Get double the magic here. Creamy white sand, inviting blue waters and teeming marine life are all yours to enjoy once you set foot in the area. Bring your tent and camp overnight. Go swimming and snorkeling to your heart’s content. You might even spot a dolphin or two! Water bikes and kayaks are also available for rent. You can take a 3-hour van ride either from Ormoc or Tacloban to get to Palompon. From the Palompon terminal, you can then hire a boat to take you to Kalanggaman Island. Expect this part of the trip to take around an hour. 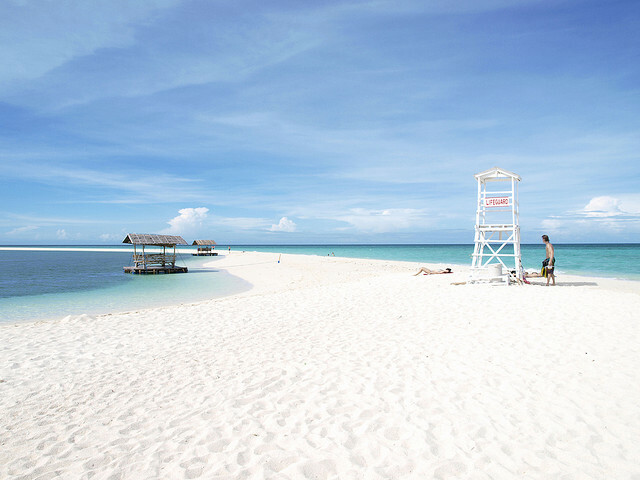 Located all the way to the southern tip of the Philippines where only a few intrepid travelers visit, this 3-kilometer sandbar will welcome you with its immaculately fine white sand. You might also have a chance to converse with some Badjaos in the area or take a peek into their lifestyle. Still considered as ‘pristine’ and ‘untouched’, a visit to this place will surely be a highlight in anyone’s trip to the Philippines. Access is via the Sanga-Sanga airport. Upon arrival, head to the tourism office to get yourself a guide. This is advisable for convenience and if you are worried about the safety issues often heard about the southern part of the Philippines. Then head to the private dock near the governor’s house and hire a small motorboat to take you to the sandbar. This C-shaped sandbar is viewable from the air as your flight prepares its descent to the Camiguin airport. True to its name, it is pristine white and simply gorgeous. Surrounded by turquoise waters filled with colorful fishes and coral reefs and sporting a jaw-dropping backdrop of volcanoes, you cannot deny the beauty of this place. From the Camiguin airport, head to the Mambajao jump off point where you can hire a small motorboat to take you to the sandbar. 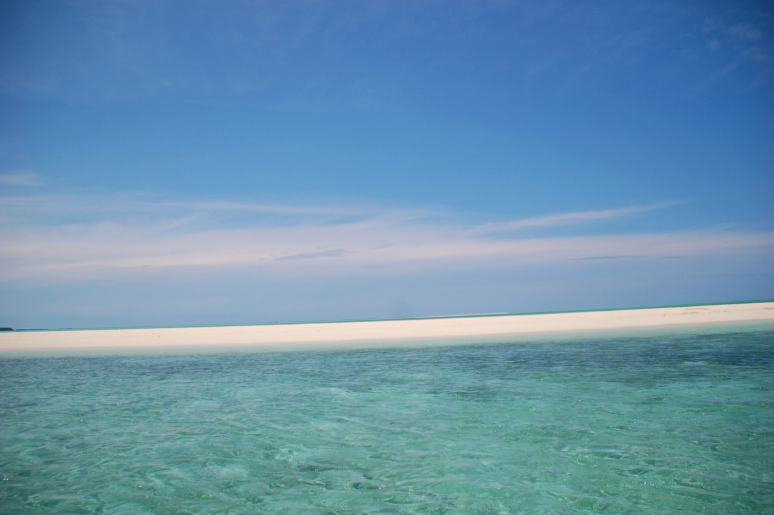 These are just a few of the many wonderful and secluded sandbars in the Philippines. So pack the sunscreen and those flip flops and take yourself to paradise!